Many manufacturing, construction, retail, and entertainment industries rely on scissor lifts to raise and move workers to different areas during a construction job or other project. When scissor lifts are stationary and extended, they pose hazards similar to scaffolding. Prompted by ten fatalities and over twenty injuries in the span of one year, the Occupational Safety and Health Administration conducted an investigation and found that the injuries and deaths most frequently occurred due to safety failures by the employer. Even with proper training, maintenance and use, some scissor lifts can collapse due to manufacturing defects. At the Clark Law Office, we have extensive experience investigating and litigating claims against manufacturers of deficient scissor lifts. Employers are responsible for providing workers with instructions on how to work safely on, with and near scissor lifts. Workers must be told how to handle supplies while on a scissor lift. They should also be trained in how to respond to hazards that they encounter around the worksite, such as electrical wires. Workers also should be taught how to report equipment defects and how to make maintenance requests. To avoid scissor lift injuries from falling, there must be guardrails installed on the machine. To ensure stabilization, guidelines for safe movement must be provided. Safety systems to prevent the lift from collapsing need to be maintained and not bypassed. Workers are entitled to worker conditions that do not pose the threat of serious harm. They have the right to receive training and information regarding workplace dangers, how to prevent them, and applicable OSHA standards. At the Clark Law Office, we focus our practice on workplace injuries, including workers’ compensation injuries from scissor lift accidents. 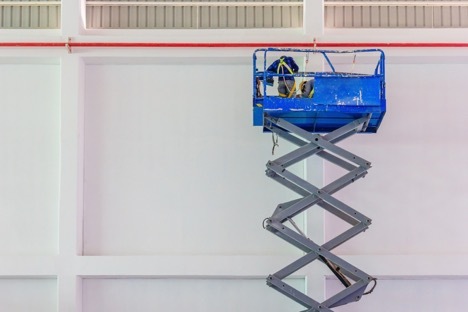 We also have extensive litigation experience regarding scissor lift defects from improper design and improper manufacturing. Collectively, our attorneys have over 80 years of experience in fighting for the rights of our clients. We listen to the needs of each client and strive to achieve the resolution they desire. We are located in Lexington, KY and proudly serve Central and Eastern Kentucky. Due to our focused experience with scissor lift injuries, we also help law firms in other jurisdictions with these cases. Call us today at (859) 219-1280 to discuss your legal options.